The Southern Association of Colleges and Schools Commission on Colleges (SACSCOC) is the regional body for the accreditation of degree-granting higher education institutions in the Southern states. It serves as the common denominator of shared values and practices among the diverse institutions in Alabama, Florida, Georgia, Kentucky, Louisiana, Mississippi, North Carolina, South Carolina, Tennessee, Texas, Virginia and Latin America and other international sites approved by the Commission that award associate, baccalaureate, master’s, or doctoral degrees. Tyler Junior College (TJC) is accredited by SACSCOC to award associate degrees and certificates. As of fall 2016, TJC is accredited by SACSCOC to award Level II degrees, beginning with a bachelor of science in dental hygiene. 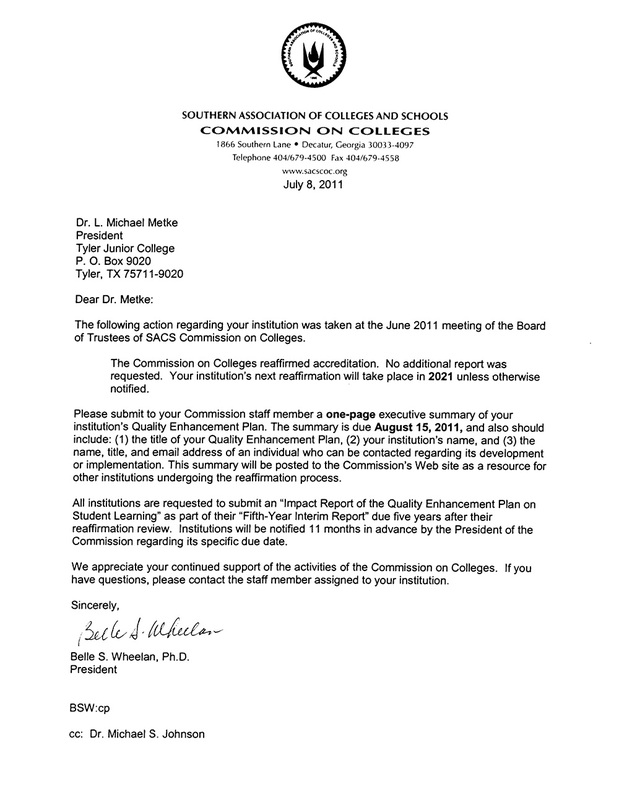 SACSCOC reaffirmation of accreditation follows a 10 year cycle; Tyler Junior College was last reaffirmed in June 2011. The College is currently preparing its Fifth-Year Interim Report for a September 2016 submission as well as planning for a Substantive Level Change campus visit to verify the College’s ability to offer baccalaureate degrees and for a Fifth-Year Off-Campus Sites visit to evaluate dual enrollment programs and TJC-Rusk, both in October 2016. Questions about Tyler Junior College’s accreditation? Contact the College’s SACSCOC Liaison, Dr. Cheryl Rogers, crog@tjc.edu , or the association directly at Southern Association of Colleges and Schools Commission on Colleges, 1866 Southern Lane, Decatur, GA 30033 • (404)679-4500 • Fax: (404)679-4558.